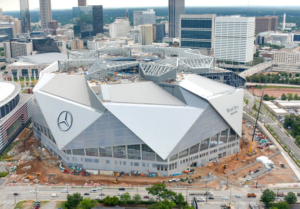 In a somewhat surprising announcement, AT&T said it will provide backbone bandwidth for the Wi-Fi network at the new Mercedes-Benz Stadium in Atlanta, as part of a partnership deal that makes the carrier the “Official Communications Provider” for the Atlanta Falcons’ new home. Announced today, the deal calls for AT&T to provide twin redundant 40 Gbps pipes to power the 1,800 Wi-Fi APs that are inside Mercedes-Benz Stadium. As reported earlier by MSR, the Mercedes-Benz Wi-Fi network will primarily use under-seat AP deployments in the seating bowl. AT&T said it will also provide “monitoring and maintenance” for the stadium’s Wi-Fi network, and will also bring its DirecTV service to the venue’s IPTV system, making that content available to the more than 2,000 digital displays in the stadium. Mercedes-Benz Stadium is scheduled to formally open later this summer, for one of the Falcons’ preseason games. What makes this announcement interesting to the stadium networking industry is the fact that there is no mention of any participation by AT&T on the venue’s DAS network, which will be running on Corning equipment. For most of the recent past, AT&T has been pulling away from stadium Wi-Fi deployments and concentrating on DAS funding in large public venues. Its main competitor Verizon Wireless has been much more active recently on the stadium Wi-Fi front, helping fund Wi-Fi deployments in a number of NFL stadiums, including those in Green Bay, Denver, Seattle, Houston and others. AT&T does continue to participate in network deployments at AT&T Park in San Francisco and AT&T Stadium in Arlington, Texas, among others. The press release out today does not say whether or not AT&T customers will have their own SSID or network space reserved, a feature Verizon usually secures for its customers when it helps fund a stadium’s Wi-Fi network. The release did say that as part of the deal AT&T will also sponsor the “AT&T Perch,” which is described as “a permanent interactive gathering spot” located on the concourse above the stadium’s west end zone. According to the release the Perch will have multiple screens where fans can watch NFL content including DirecTV’s Sunday Ticket programming and the NFL Network’s RedZone channel.